COULD NOT BE MORE PROUD OF MY OCHO!!! Ocho spent 9 months in Germany and Holland training with Hans and then another 3 months on tour in Europe with Uros and now I am SUPER excited to announce that OUR CHAMPION WILL SOON BE COMING HOME!!!!!!! ADRK KLUBSIEGER in Rottweil, Germany!! It was such an amazing experience and I am so very honored to have competed with so many talented and dedicated breeders and handlers and some of the world’s best Rottweilers! HUGE CONGRATULATIONS to all the winners and participants! 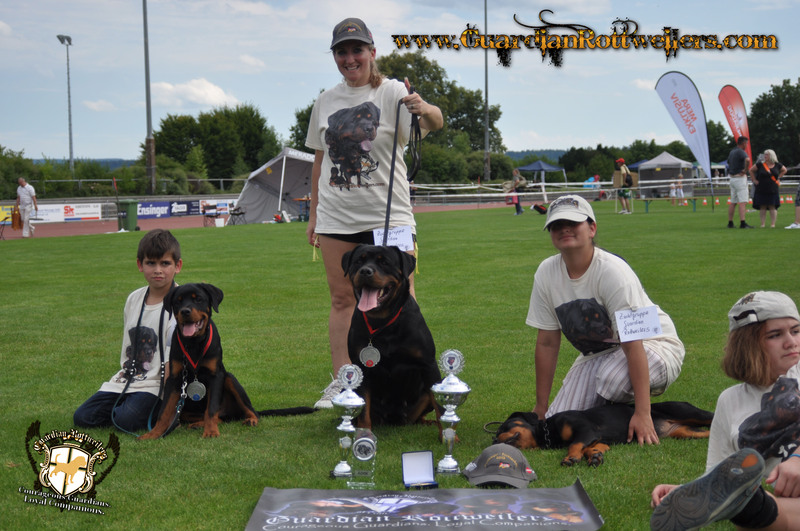 Guardian Rottweilers Zuchtgruppe (Kennel) FIRST PLACE!!! Link to us? copy and paste the code below to your links page. Due to indiscriminate breeding out of either ignorance of the breed standard (not caring enough to lean the correct weight, height, type, character, health issues to be aware of, etc. associated with the breed) or indifference (knowing that the dog you are breeding is incorrect, in poor health or with poor character, and breeding anyway out of greed) combined with poorly chosen and educated owners (breeders who are more interested in money than taking the time to make sure that the families they are choosing for their puppies are both the correct families and have received all necessary health, training, socializing, etc. information), the reputation of the Rottweiler has been unfairly jaded. The Rottweiler is a powerful, intelligent, majestic, proud, courageous, affectionate and profoundly loyal breed of dog. I firmly believe that a well bred, well raised Rottweiler is without a doubt the absolute best companion. Quality does not happen by accident. By breeding only pure German and European lines and concentrating not only on the conformation of our Rottweilers, but the temperament as well, the United States will be able to have what Europe has held sacred for generations. We strive to produce calm, confident, courageous dogs with an inherent desire to protect home and family. At Guardian Rottweilers, our dogs are our family. They are raised with our children and in our home. We have traveled to Europe and hand selected each and every dog we use in our breeding program. We personally met and handled the parents, the siblings, and when possible, the progeny of these magnificent animals. Each breeding is chosen with specific consideration to what each parent brings to the table and which bloodlines will produce the best possible offspring from the breeding pair. Every single dog used in our breeding program can be traced back to the first Rottweilers in Germany around 1907-1914! 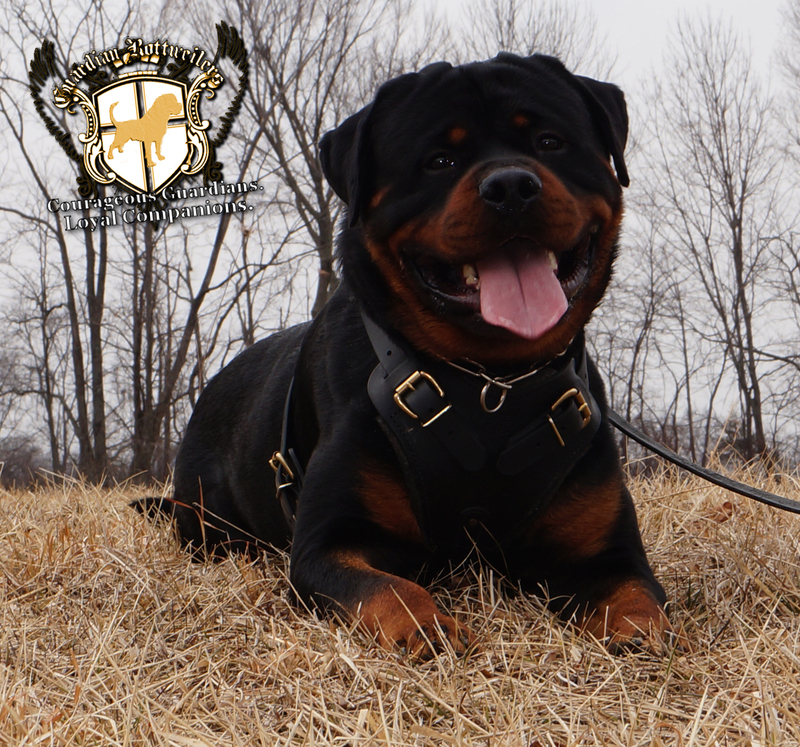 Just because we have amazing studs already at Guardian Rottweilers does not mean that their genetic contribution will bring out the best in every single female. We will travel worldwide for the correct stud/breeding and typically plan our breedings generation in advance. Once born, our puppies are socialized with babies, children, other adult dogs, our kitties, and a variety of our children’s and neighbors’ pets including: chickens, bunnies, potbellied pigs and goats. Early neurological stimulation in newborn puppies is also critical for development. When the pups are of correct age, we individually evaluate every puppy for conformation and character. The Rottweiler is not the correct breed for everyone. He is a strong minded, confident dog with a very balanced character. He is incredibly intelligent and can be stubborn. However, he is the most well rounded breed of dog capable of any job asked of him. You can find him in every venue of competition from conformation shows, to field/working, agility, carting, weight pulling and herding. He makes a wonderful therapy or service dog and works tirelessly in Search and Rescue, explosive detection, Police, Military and Personal Protection. 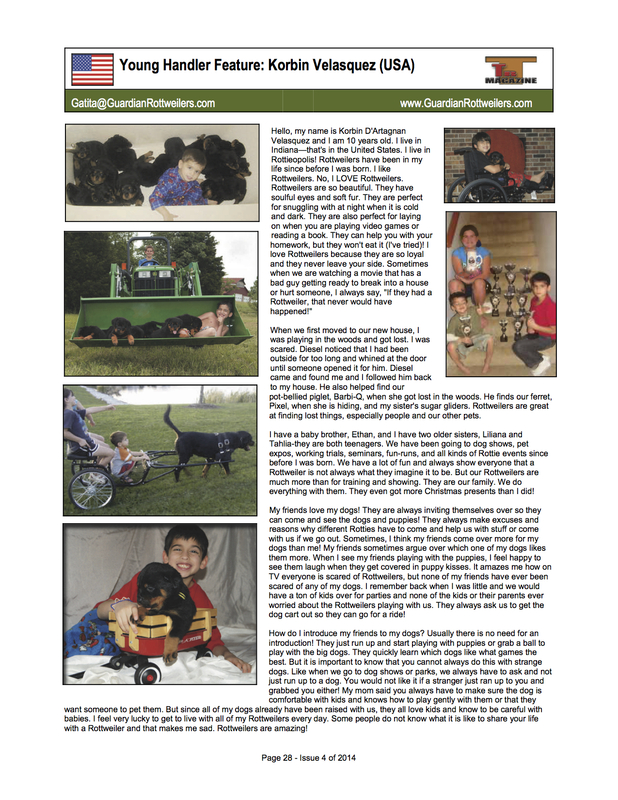 Please enjoy the site and learn more about these magnificent and noble dogs. When you have a male puppy with a head this strong and a frame this powerfully built, then it is quite the accomplishment! But to have a 6 week old female that is this genetically blessed is phenomenal. Extreme head type with a very heavy topskull and short, full muzzle. She is heavy and stocky and built like a brick house! Character is just as exceptional as her conformation.